One Shall Conquer... One Shall Fall! The eternal struggle between the heroic Autobots and the evil Decepticons reaches its thrilling conclusion in this 2 disc Collectors Edition, bringing you 12 of the best Transformers Armada episodes, including tales from Unicron Battles. Episodes: Decisive Battle, Tactician, Past 1, Past 2, Threaten, Crisis, Miracle, Dash, Cramp, Union, Origin, Mortal Combat. Special Features Includes Exclusive Art ..
From director Michael Bay and executive producer Steven Spielberg comes the "hugely entertaining" 'TransformersAge Of Extinction. With humanity facing extinction from a terrifying new threat, it's up to Optimus Prime and the Autobots to save the world. But now that the government has turned against them, they'll need a new team of allies, including inventor Cade Yeager (Mark Wahlberg) and the fearsome Dinobots!.. Own Transformers - Classic Animated Collection DVD from Deff, DVD, Blu-Ray & 4K Video Specialists - Free UK Delivery..
Own Transformers - G1 Decepticon Symbol Mug from Deff, DVD, Blu-Ray & 4K Video Specialists - Free UK Delivery..
Own Transformers - Robots In Disguise More Than Meets The Eyes DVD from Deff, DVD, Blu-Ray & 4K Video Specialists - Free UK Delivery..
Own Transformers - Robots In Disguise Roll Call Roll Out Mug from Deff, DVD, Blu-Ray & 4K Video Specialists - Free UK Delivery..
Five more episodes from the first series of the CGI-animated franchise in which the Autobots and Decepticons return to do battle once again. Optimus Prime, Ratchet, Bulkhead, Arcee and Bumblebee face new dangers, including an invasion of miniature, metal-devouring robots; an ancient warrior named Skyquake; and an infiltrator trying to discover the location of the Autobot base. The episodes are: 'Masters and Students', 'Scrapheap', 'Con .. The first five episodes of the CGI-animated franchise in which the Autobots and Decepticons return to do battle once again. After years of peace, the Decepticons are close to raising an army of dead transformers by using the substance known as Dark Energon. As Optimus Prime, Ratchet, Bulkhead, Arcee and Bumblebee prepare for war, three human teenagers find themselves caught up in the action. The episodes are: 'Darkness Rising: Part One'..
Five more episodes from the first series of the CGI-animated franchise in which the Autobots and Decepticons return to do battle once again. While Arcee and Jack have their hands full dealing with the crash-landed Decepticon Airachnid, Optimus becomes infected with a deadly Decepticon plague, the cure for which is hidden within Megatron's mind. 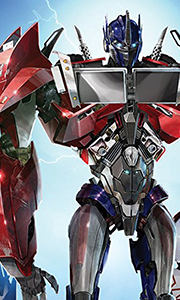 The episodes are: 'Speed Metal', 'Predatory', 'Sick Mind', 'Out of His Head' and 'Shadowzone'..
Own Transformers Prime - One Shall Stand DVD from Deff, DVD, Blu-Ray & 4K Video Specialists - Free UK Delivery.. The complete first season of the CGI-animated franchise in which the Autobots and Decepticons return to do battle once again. After years of peace, the Decepticons are close to raising an army of dead transformers by using the substance known as Dark Energon. As Optimus Prime, Ratchet, Bulkhead, Arcee and Bumblebee prepare for war, three human teenagers find themselves caught up in the action. The episodes are: 'Darkness Rising: Part On..
Own Transformers Prime Series 1 - Darkness Rising - Parts 1 - 5 DVD from Deff, DVD, Blu-Ray & 4K Video Specialists - Free UK Delivery.. They're huge metallic beings with the ability to disguise themselves as earthen vehicles, planes and technology... and they're here on Earth, among us. They're fighting a civil war with the future of the galaxy at stake. Only Optimus Prime and his heroic Autobots can prevent the evil Megatron and his Decepticons from conquering Earth, and enslaving its people. They're the Transformers: Robots in Disguise. Special Features Interviews Wi..
Optimus Prime continues the struggle against the evil Decepticons in this, the second season of Transformers. The first 24 episodes from Season 2 introduce us to new Transformers, including Blaster and Perceptor. Old favourites the dinobots, continue to make life difficult for the Decepticons and the Autobots alike. The battle rages on to conquer the Earth and return to Cybertron victorious. Special Features Un-edited Mistake Reel, Epi.. The second part of the Transformers Season 2 sees the battle between the heroic Autobots and evil Decepticons getting very heavy indeed. The Special teams known as the Stunticons, Aerialbots, Protectobots and Combaticons enter the fray and show that in their combined forms of Menasor, Superion, Defensor and Bruticus there is definitely much more than meets the eye! Special Features Comprehensive Character Profiles, Quiz, Season 2 Part .. Season Three of The Transformers continues where Transformers: The Movie left off. Optimus Prime is dead, Unicron has been destroyed and the new leaders, Galvatron and Rodimus Prime, continue the battle. In contrast to the first two seasons, much of the action here takes place on the Transformers home world of Cybertron, thus less of the stories involve humans. Of course you can never keep a good robot down, and as the movie promised, t..
Own Transformers Prime - Armada DVD from Deff, DVD, Blu-Ray & 4K Video Specialists - Free UK Delivery..
Own Transformers Prime - Battle For Darkmount DVD from Deff, DVD, Blu-Ray & 4K Video Specialists - Free UK Delivery..
Own Transformers Prime - Beast Hunters - Predacons Rising DVD from Deff, DVD, Blu-Ray & 4K Video Specialists - Free UK Delivery..
Own Transformers Prime - Nemesis Prime / Toxicity DVD + Toy from Deff, DVD, Blu-Ray & 4K Video Specialists - Free UK Delivery..
Own Transformers Prime - Nemesis Prime DVD from Deff, DVD, Blu-Ray & 4K Video Specialists - Free UK Delivery..
Own Transformers Prime - Orion Pax DVD from Deff, DVD, Blu-Ray & 4K Video Specialists - Free UK Delivery..
Own Transformers Prime - Orion Pax DVD + Toy from Deff, DVD, Blu-Ray & 4K Video Specialists - Free UK Delivery..
Own Transformers Prime - Toxicity DVD from Deff, DVD, Blu-Ray & 4K Video Specialists - Free UK Delivery..
Own Transformers Prime - Toxicity DVD + Book from Deff, DVD, Blu-Ray & 4K Video Specialists - Free UK Delivery..
Own Transformers Prime Season 3 DVD from Deff, DVD, Blu-Ray & 4K Video Specialists - Free UK Delivery..
Own Transformers Robots In Disguise - Character Strips Mug from Deff, DVD, Blu-Ray & 4K Video Specialists - Free UK Delivery..
Own Transformers Robots In Disguise - Grid Mug from Deff, DVD, Blu-Ray & 4K Video Specialists - Free UK Delivery..
Own Transformers Robots In Disguise - New Mission DVD from Deff, DVD, Blu-Ray & 4K Video Specialists - Free UK Delivery..
Own Transformers Robots In Disguise - Rumble In The Jungle DVD from Deff, DVD, Blu-Ray & 4K Video Specialists - Free UK Delivery..
Own Transformers Series 3 - Race For Salvation DVD from Deff, DVD, Blu-Ray & 4K Video Specialists - Free UK Delivery..